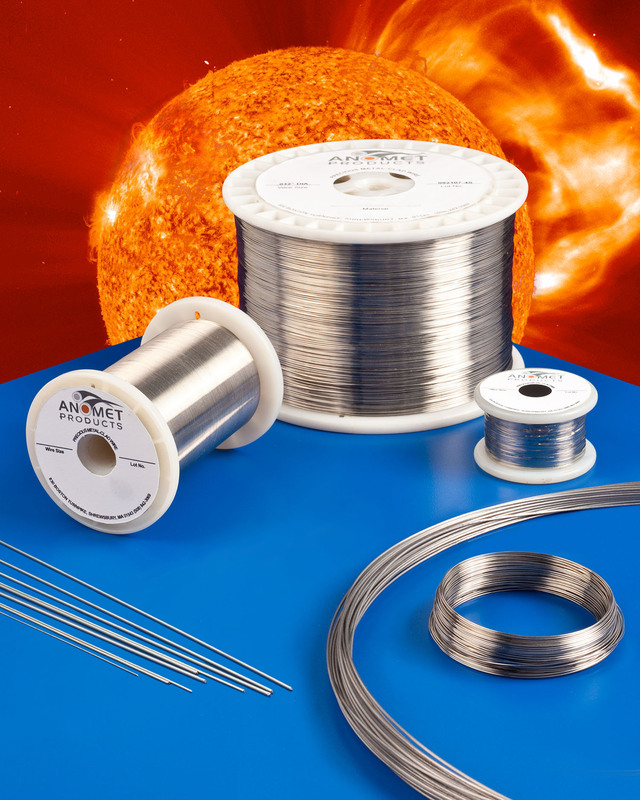 A line of metallurgically bonded platinum clad moly wire and rod for use in aerospace, electronics, semiconductor, and high-vacuum applications is available from Anomet Products of Shrewsbury, Massachusetts. Anomet Platinum Clad Molybdenum Wire is metallurgically bonded and provides high oxidation and corrosion resistance at temperatures up to 1,200°C, depending upon the application. Featuring a smooth, consistent surface finish, this PtMo wire offers superior integrity, formability, and weld-ability compared to wire that is electroplated. An economical design alternative to pure platinum wire for making connectors and switch components, Anomet Platinum Clad Molybdenum Wire is available in 0.010” to 0.060” O.D. sizes, with cladding from 14% to 38% by weight, depending upon dia. Ideally suited for use in devices subjected to harsh environments, platinum clad nickel products are also offered. Anomet Platinum Clad Molybdenum Wire is priced from $1.00 to $30.00 per ft., depending upon configuration and quantity. Literature, samples, and price quotations are available upon request.